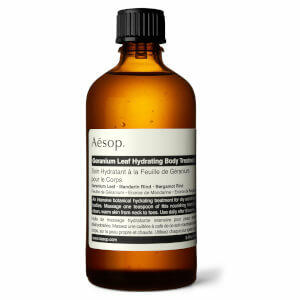 Aesop Geranium Leaf Hydrating Body Treatment (100ml) thoroughly hydrates and restores tired dry skin. Presented as a concentrate of fragrant aromatic oils and balms, just one teaspoon of Geranium Leaf Hydrating Body Treatment, massaged into the body after a shower or bath, refreshes skin leaving it supple and younger looking. Rapidly absorbed and intensely hydrating, Aesop's carefully blends active botanicals distilled from geranium leaf, mandarin and bergamot. Vital moisture lost by skin in hot, dry environments and through intense physical activity is quickly replenished and skin tone restored. 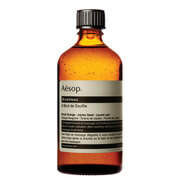 For that feeling of pure luxury, add a small quantity of Aesop's Hydrating Body Treatment blended milk to a relaxing hot bath. Bought this to complete my range of Geranium Leaf body care products. The OH loved the scent. Great as a massage oil after a warm shower.